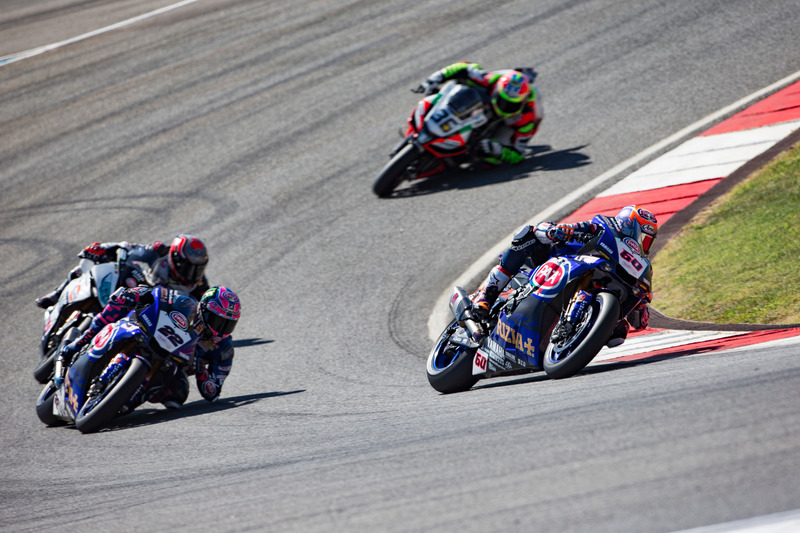 was a day of highs and lows for the Pata Yamaha Official WorldSBK Team in Portimao on Saturday for round ten of the 2017 FIM Superbike World Championship. Michael van der Mark showed his class after a tricky first lap to charge his way through the field and battle his way to a fifth-place finish. His teammate Alex Lowes was fighting in the top six and chasing the podium when a small mistake saw him crash at Turn 5, the British rider remounting to finish in 18th place and collect vital data for Race 2 on Sunday. Van der Mark got Saturday off to a good start at Portimao by improving his pace overnight to place fourth in FP3 and then managed to qualify at the front of the third row, to start Race 1 from seventh on the grid. When the lights went out, the 24-year-old Dutch rider had a good start on his Yamaha R1, but lost a few places during the first lap and found himself down in ninth. Settling into a good rhythm, he then started to fight his way past the riders in front, getting involved in a number of good battles along the way. As the race went on his pace improved and by lap 14 he had fought his way up to fifth and set his sights on the podium battle ahead of him. Unfortunately, the laps ran out while he was chasing down the podium contenders and he crossed the line in fifth to collect 11 championship points, which means he remains seventh in the standings with 146 points – just seven points behind Xavi Forés in fifth. Due to the 2017 Race 2 grid rules, van der Mark will line up for Sunday’s race in the middle of the front row in second, confident of being able to fight at the front. His teammate Lowes also improved from Friday to end FP3 in fifth and then went one better in qualifying, setting the fourth fastest time and starting Race 1 from the front of the second row. Unfortunately, he didn’t have the best of starts and found himself in tenth at the end of the first lap. Like his teammate van der Mark, it didn’t take the 27-year-old long to find his rhythm and he started to scythe his way through the field. He had fought his way up to sixth, when a small mistake on lap 8 at Turn 5 saw him lose the front on a large bump. Valiantly, he immediately ran to his bike and re-mounted but rejoined right at the back of the field. Determined to make up for his mistake, he set about hunting down the riders in front but was forced to pit on lap 15 for repairs, and when he returned to the track he was a lap down. Despite this, he showed good pace and went on to cross the line in 18th position, in the process collecting vital data for his team to help them for Race 2 on Sunday. Lowes remains fifth in the championship standings with 169 points and will start Sunday’s Race 2 from the head of the fourth row in 10th. The Pata Yamaha Official WorldSBK Team are back in action on Sunday at 9:50am local time for Warm Up, with the 20-lap Race 2 due scheduled to start at 3pm. Check out the results from Race 1. “A positive race and a disappointing race depending on which side of the garage we focus on. For Alex, the start from the second row was something of a disaster and it’s a problem which the team will focus upon and improve as quickly as possible. That said, Alex’s recovery was very good to get up into the top six and looking at his pace and how the race developed, a challenge for the podium was possible, but these things happen and the big bump in turn 5 just caught him out.